The Sheffield University Symphony Orchestra performed on Sunday 11th May 2014. Ok, so we're not the Berlin Philharmonic but that's not the point I'm about to make. What happened on the 11th was the culmination of a teaching, learning and performing ethos that sets The University of Sheffield apart from most other music departments. Sheffield has a superb concert series. More than 60 concerts a year - an amazing contribution to the City's cultural life. The orchestra performs twice a year in this series. The membership is university wide and draws students and staff from other departments closer to the music department and its students. The music department supports the orchestra whilst offering its students opportunities to compose for, perform with and conduct the major ensembles. An amazing opportunity for those who are thinking of extending their experience and careers in these areas of endeavour. And so it was in the first half of the concert. Elgar's 'Cockaigne' overture was conducted by Tim, a third year undergraduate who has even decided to switch to first study conducting - and after careful consideration we accommodated this: that's just how student-facing we really are. A very spirited performance resulted. Ella then sang the soprano part in Finzi's 'Dies Natalis' most beautifully. Ella is a first year undergraduate with a superb voice. When she auditioned for the opportunity, it was clear that she has long term plans to make singing her career. Finally, the orchestra played Vaughan Williams' 'Sinfonia Antartica'. This involved sourcing celesta and more problematically a real wind machine, plus organ and small choir of female voices. And with the symphony having such a history - beginning its life as music for film, the opportunity to work with the idea of the Antarctic, and Scott's magnificent though fatal expedition led to an education project - run by music students who went into five local schools. Working closely with teachers the groups made pieces, looked at Scott's diaries, watched bits of the film and learned about the orchestra. All this led to a morning session on the 8th May where 150 kids of KS2 from five schools came to the University and took part in numerous educational activities culminating in a performance of their pieces interspersed with sections of the symphony played by the orchestra. Many of these kids had never seen nor heard a live orchestra before and their natural wonder at something as simple as a wind machine was touching. The 'project' was funded by the RVW Charitable Trust and put together by our concerts director, Stewart. This is what education at University is about - real joined-up activity with potentially huge impacts. Great for all to say 'we did this'. By the way, none of this makes its way to students' degree classifications. They gave their time freely and for that I'm enormously grateful. Education is not an equation as some would have it and music is not just something you listen to whilst driving or cooking your tea. Sound Junction 2014 looks to be one of the very best yet. This year the focus is upon 'community'. As you will see from the picture and the link to the programme the community of students at the University of Sheffield Sound Studios from undergraduates to PhD will be sharing their music alongside my own work The Battle and works by my colleague Adam Stansbie. On Thursday 3rd the evening concert is given over to instruments, improvisers and computers with Mustek featuring Max Hummus. On Friday 4th we celebrate the community that is the Composers Desktop Project with works by Rajmil Fischman and Archer Endrich. If you are interested in joining the community that is sonic art at Sheffield University, do come to any/all of these events. It's completely free. I am really excited to be presenting my pieces Nebula Sequence and The Battle at Piednu in Le Havre on Tuesday 1st April. Click here for the incredible programme on offer. It's a real honour to be playing alongside Eric Cordier and meeting Brunhild Ferrari again (she was also on the line-up at Akousma X in Montreal last October). This festival looks like it has something for everybody. If only the ferry crossings were easier! The University of Sheffield and the City really need a new concert space for circa 200 people. Step forward the Church of the Nazarene on Victoria Street. It's beautiful, has an amazing acoustic which would work extremely well with classical music and would make an excellent recording venue. It's right next door to the Soundhouse so the studio facilities are already in place. It would require some variable acoustics as the space would need to adapt to a variety of musics (classical, world, folk, experimental, electroacoustic). A feasibility study has already been drawn up making this place look like a cultural gem (and a potential earner too). We need creative partners and financial support. If you are interested, please do not hesitate to get in touch. 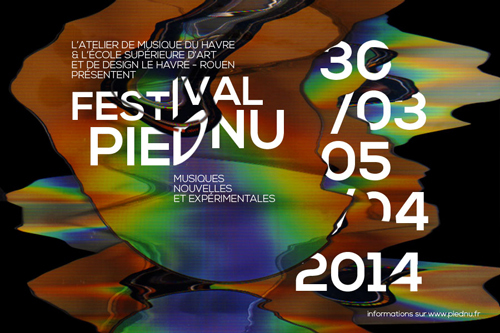 PIEDNU in Le Havre (Now how long should it take to get there in April? Nice drive to Portsmouth then direct on a wonderful ferry - almost, but some serious overnight journeys so...it's train to London, London to Paris and Paris to Le Havre which takes literally all day). But I have half a concert at this wonderful festival. Sound Junction 2014. April 2 - 4. I am really excited about this year's festival as we have a host of home-grown works to present. Whilst this may not guarantee a national audience (no reason though why it shouldn't), I hope as many students will come and support their friends, many of which will be presenting their work publicly for the first time. My own work 'The Battle' gets an airing on the 4th. With a warm up on the 14th March in Leeds at IFimPaC. I am really looking forward to the 11th May when the University of Sheffield Symphony Orchestra will play Elgar, Finzi and Vaughan Williams 'Sinfonia Antartica' under my creaky baton. Elgar's 'Cockaigne' is conducted by Tim Walker (third year undergraduate) and the Finzi 'Dies Natalis' is sung by the wonderful Ella Taylor (first year undergraduate). If there are any prospective students reading this blog, not many other universities in the country offer these kind of opportunities so early on in your student lifetime. Come to Sheffield! So, moving from here http://uspace.shef.ac.uk/people/mu1ajm/blog to here. for Francois Bayle on the 26th.